Screen cleaning; It’s not an area we normally cover but since it seems to be a question which crops up quite frequently, we thought we’d write a brief review of an interesting product in the screen cleaning cloth segment. Many solutions exist in the market for cleaning your monitors and other products, particularly nowadays where we have glossy phones, iPads, tablet PC’s etc and a whole world of touch-screen technology. We’ve been sent a sample of a microfiber screen cleaning cloth by US based company CTA products who manufacturer all kinds of cleaning solutions and microfiber technology. CTA products have been around since 1996 offering “premium quality microfiber products” to the masses. 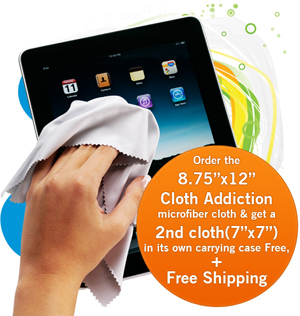 The product we have been sent is their ‘Cloth Addiction microfiber cloth’. This particular product is designed to be used to clean many different screens including those of desktop monitors, iPads, mobile phones, screen protectors and even camera lenses. 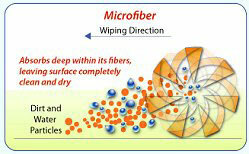 Microfiber consists of very fine threads of polyester and polyamide (nylon) that combine to form a single thread. Microfibers are so thin (100 times thinner than a single strand of human hair) that when they are woven together they create a surface area 40 times more than that of a regular fiber – creating an expanded surface area with dramatically enhanced absorbing power due to the capillary action of the fine threads. Microfiber is traditionally defined as a fiber with a denier of less than one. Denier is a measure of thinness of fiber and is the weight in grams of a continuous fiber of 9,000 meters. Locks in dirt: Unlike the rounded threads of ordinary cloth which just push dirt along the surface, the numerous wedge-shaped fibers of microfiber grab the particles of grime and pull them into the dense internal structure. Dirt stays locked in the microfiber towel until it is washed. Super absorbent: High-quality microfiber holds up to 7 times its weight in water. Streak and scratch-free cleaning: Each strand of microfiber is comprised of polyester and polyamide (nylon). Polyester is lyophilic, which means it attracts oil, and polyamide is hydrophilic, which means it attracts water. Grease, oil, water and other liquids adhere directly to the fibers for chemical-free, safe cleaning. The softness of the material prevents scratches on even the most delicate surfaces. Durable and cost effective: Microfiber cloths are extremely durable, cost effective and easy to care for. They can be washed hundreds of times and still maintain their effectiveness. Simply hand or machine-wash with mild soap. Why is this cloth the world’s finest microfiber screen cleaning cloth? With the Cloth Addiction cloth CTA have introduced for the first time a new generation of microfiber cloth - twice as thin and many times as soft as the finest microfiber cloths currently available. High quality microfiber cloth is very thin and measures 0.13 denier, however this product is twice as thin and measures 0.065 denier. These are very thin individual fibers, each fiber strand is 200X thinner than a strand of human hair. Good quality microfiber cloths consist of 60-70% microfiber content. 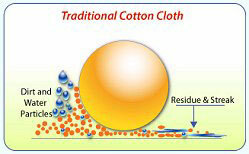 Cloth Addiction microfiber cloth consists of 100% microfiber content. What this means is better absorption of dirt and faster absorption of dirt. These ultra fine fibers are also what make the cloth so incredibly soft. That is why CTA say it is the world’s finest cleaning cloth. Above: front and back views of the package. Click for larger versions. The cloth is provided in a small plastic packet as shown which measures 12 x 10 cm. The packet label promotes a few features of the product and its promotional image is the cloth being used on an iPad screen. This seems to be the primary market of the product but it can of course be used for desktop displays and TFT monitors. It should also be good on glossy monitor bezels and stands which also attract a lot of marks and finger prints over time. Inside there are two big cleaning cloths, one of which is shown here. The cloth itself is quite large as well at 8.75” x 12” (as big as A4 paper). This makes it a lot bigger than small spectacle cleaning cloths and the type that sometimes get provided with desktop monitors. We have seen a few provided with monitors we have tested over the years but most are less than half the size of the cloth addiction product. The standard package apparently comes with one large (8.75 x 12”) and one smaller cloth (7 x 7”) but the package we had featured two large cloths instead. CTA’s website guidance states that the cloth is best used dry, and that they are hand and machine washable if needed. It’s also suggested that you can just wrap the cloth around your iPad or device when its in its case so that it helps keep the screen clean even when put away. One thing which is notably missing from the iPad package you get from Apple is something to help you keep the screen clean and free of messy finger prints. I have an iPad v1 and it has a very nice looking glossy glass front screen coating. However, being a touch screen tablet solution you are of course always leaving finger prints and smears over this screen which at the right angle can look pretty unattractive and ruin the lovely appearance of a shiny Apple product. I’m not sure why Apple didn’t bundle the iPad with a cleaning cloth of some sort to be honest. We deliberately made the screen nice and messy and tried the Cloth Addiction cloth. I was impressed by the ease of use of the cloth and you only really need a few light circular swipes to clean the screen very effectively. In contrast I tried another unbranded glasses cleaning cloth I had which did the job but required far more pressure to clean to the same level. We of course tested the cloth on various desktop monitors and TV screens. 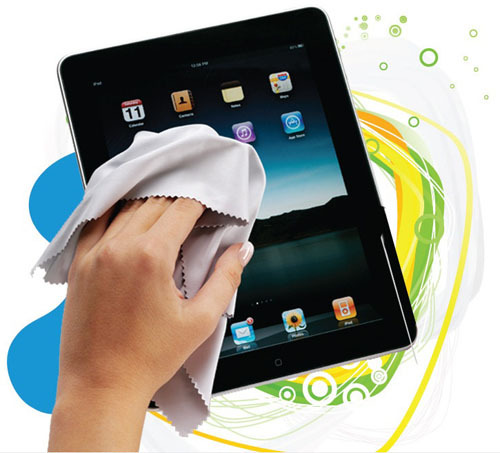 It worked very well at cleaning smudges, finger prints and dust from all the screens we tried. It was particularly useful on glossy bezels and screen coatings and required only a little pressure to wipe the marks clean away. It did seem to be easier to use than other clothes we tried and we even used it on mirrors and windows around the office. It’s obviously hard to go into a lot of detail about something like a cleaning cloth, but overall I was impressed by the product and its ability to clean. It was light and very soft and seemed to clean very effectively. Only a light wipe is needed to remove finger prints, dirt and marks from the front of displays and touch-screen devices. It also seemed to remain very clean in itself even after a lot of use. Other cleaning clothes can easily pick up marks and dirty areas after a bit of use but the microfiber cloth seemed to absorb and retain the dirt very well. The cloth is also available at a low price of $8.95 USD which gives you one large cloth, a free 7 x 7” smaller cloth in its own carrying case and free shipping. CTA even offer a guarantee stating that if you find a microfiber cloth softer and more effective than Cloth Addiction, return it for a full refund. That’s quite a promise but I’m sure you won’t be disappointed in the product if you need a decent cloth to help keep your screens and other devices clean.